This solution provides best practices guidelines for deploying Identity Awareness in large-scale deployments that include either a large number of users (>2,000), a large number of Domain Controllers (>20), or multiple sites. Identity Awareness supports up to 200,000 identities per Security Gateway since R80.10, or in R77.30 with Giraffe HF (see sk120979). Before the large scale enhancements introduced in R80.10 and Giraffe HF, Identity Awareness supported up to 30,000 identities per Security Gateway. Note that the number of supported Identity Agents per Security Gateway is 20,000. Both AD Query and Identity Collector are Check Point solutions to analyze Security Events logs which are generated on Microsoft Active Directory server and provide information aobut user/machine login. Check Point Identity Collector is a Windows-based application which collects information about identities and their associated IP addresses, and sends it to the Check Point Security Gateways for identity enforcement. Microsoft Active Directory Domain Controllers: Windows Server 2008, Windows Server 2008 R2, Windows Server 2012, Windows Server 2012 R2, Windows 2016. Cisco Identity Services Engine (ISE) Servers, versions 2.0, 2.1, 2.2 and 2.3. For more information about Identity Collector, please read sk108235. Reduces the load on the Security Gateway - the agent is doing the queries instead of the Security Gateway.Reduces the load on the DCs - the native Windows API used consumes less resources.The Identity Collector requires no administrator or administrator-like permissions. Only permission required is read-only access to the domain security logs.One Identity Collector can serve multiple Security Gateways, even from different CMA. Identity Collector can work with up to 35 Microsoft Active Directories. Identity Collector supports handling 1900 security events per second (comparing to AD Query which supports 800 per second). AD Query is a clientless identity acquisition method. When using AD Query, the Security Gateway connects to the Active Directory Domain Controllers using Windows Management Instrumentation (WMI), and subscribes to receive Security Event logs that are generated, by default, on the Domain Controllers, when users login. These Security Event logs are parsed by the Security Gateway to associate a user/machine to an IP address. A single Security Gateway can parse up to ~400 (on 4000-series appliances) or ~800 (on 12000-series and above appliances) Security Event logs per second, querying either a single Domain Controller, or multiple Domain Controllers. When the Security Gateway receives too many Security Event logs per second, it may become overloaded, and PDPD process may utilize the CPU at a high level. When an organization consists of multiple geographical sites, it is recommended to configure AD Query on each site, querying only the site's local Domain Controllers and sharing identities with other sites as necessary (for example, if users from Branch Office "B" need access to resources in Branch Office "A", then Identity Security Gateway "B" should share identities with Identity Security Gateway "A"). Identity Sharing is configured via the 'Get identities from other gateways' option in Security Gateway properties - 'Identity Awareness' pane. In addition to taking into account geographic considerations, it is highly recommended to distribute the load of large sites between several Security Gateways on that site, configuring each Security Gateway to register to a different set of Domain Controllers based on the number of Security Event logs each Domain Controller generates. This configuration procedure is detailed in the Identity Awareness Administration Guide (R77, R80.10) - Chapter 3 'Identity Sources' - 'Specifying Domain Controllers per Security Gateway'. Use "Assume that only one user is connected per computer"
When using the 'Assume that only one user is connected per computer' option (Security Gateway properties - 'Identity Awareness' pane - 'Active Directory Query' - 'Settings...'), it is important to exclude certain servers from AD Query. Exchange Servers, Proxy Servers, DNS Servers or Terminal Servers/Citrix Servers generate a lot of AD Query traffic without substantial security value since no users actively login to those machines, and thus overload the Security Gateway. For more information, refer to sk86560 - High CPU utilization by PDPD daemon. In order to acquire identity information from Terminal Servers/Citrix Servers, use the Terminal Servers Endpoint Identity Agent. Service accounts are user accounts, and are created explicitly to provide security context for services running on Microsoft Windows Servers. Service accounts generate a substantial amount of Security Event logs, which lack real security value and overload Security Gateways with enabled AD Query / Identity Collector. It is highly recommended to exclude all known service accounts. For AD Query: Adding the service accounts to the Excluded Users / Machines list (Security Gateway properties - Identity Awareness pane - Active Directory Query - Settings... - Advanced...). For Identity Collector: Using the Identity Collector Filters to exclude the service accounts. Please read more in R80.10 Identity Awareness Administration Guide. Enhance usability by enabling Captive Portal along with AD Query and Identity Collector to acquire identities that are not acquired (for example, users that login to their computer while not connected to the organizational network). Kerberos Transparent Authentication can be used to spare users from having to re-enter their credentials. Endpoint Identity Agents - dedicated client agents installed on users' computers that acquire and report identities to the Security Gateway. Terminal Servers Endpoint Identity Agent - an Endpoint Identity Agent installed on an application server that hosts Citrix/Terminal services. It identifies individual users whose source is the same IP address. The standard behavior of the Identity Agent includes client authentication, followed by frequent keep-alive notifications sent to the Security Gateway. Keep-alive messages serve the important role of letting the Security Gateway know that the client is still connected with the reported user. When keep-alive messages are not sent in a timely manner, the Security Gateway assumes that the client is no longer connected, and closes the session. An unstable network or high utilization of the Identity Awareness daemon, such as during policy installation, might interfere with the Identity Awareness daemon's responsiveness for a short while, causing Identity Awareness clients to become disconnected and possible network outage due to the user sessions being disconnected. To avoid Identity Awareness client disconnections in such situations, the Security Gateway and the Identity Awareness client can be configured to be more tolerant of various connection issues. In large environments, the default value of 5 minutes between keep-alive messages can cause the number of open file descriptors on the Security Gateway to reach the default limit of 1024. Note: In cluster, perform these steps on all cluster members. Connect to the command line on the Security Gateway (over SSH, or console). By default, on any connection error, the Identity Agent will try to connect one more time and will then disconnect and start over. When this happen, the Identity Agent will appear disconnected and will constantly attempt to re-connect. It is possible to modify the number of attempts, so that a temporary connectivity shortage will not cause a client disconnection. when connection errors occur, the client will extend the time between each connection attempt, in order to reduce the load from the Security Gateway. Additional required change is providing some grace time on the Security Gateway. 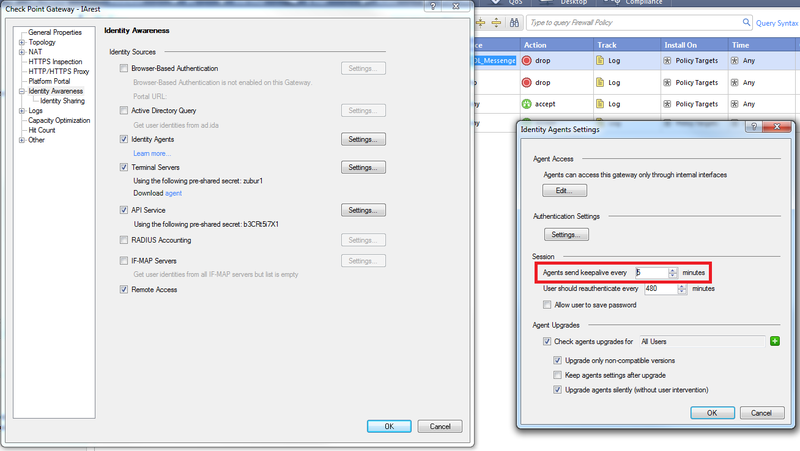 Otherwise, the Identity Agent session might be deleted while the client is trying to connect to the Security Gateway. Note: Contact Check Point Support to get a Hotfix package that adds this functionality. If exponential back-off mechanism is disabled - each retry will be done every 15 seconds. If exponential back-off mechanism is enabled - the first retry will occur after 15 seconds, the seconds 30 seconds after the first, and so on and so forth. R75.47 and R77.10 - Agent restart is required. R77.20 and above - Agent restart is not required. HKEY_LOCAL_MACHINE\SOFTWARE\CheckPoint\IA\DelayBetweenConnAttempts DWORD 10000 How much time to wait (in milliseconds) between connection failures R77.20 and above - Agent restart is not required. (15 min) The maximal delay time (in milliseconds) between connection failures - relevant only when the delay time is configured to increase between failures (e.g., if DelayFactorBetweenConnAttempts is enabled) R77.20 and above - Agent restart is not required. Note: Do not use large groups of networks in source limits for Access roles objects, because this will slow down the PDPD significantly during login and users update. Identity Awareness includes support for Nested Groups (refer to sk66561 - Controlling LDAP Nested groups configuration in Identity Awareness). However, enabling the feature may cause high load on CPU and unresponsiveness of the PDP daemon, as well as load on the Domain Controllers, particularly during policy installation. Therefore, in such cases, it is recommended to disable the Nested Groups feature and not to use nested groups in access roles. Alternatively, the depth of the Nested Groups feature should be configured to the lowest possible value and Access Roles should be respectively defined to match that depth. Disabling User Updates during policy installation is possible starting in R77.10. This configuration is no longer needed in R77.30 with Giraffe Hotfix and R80.10. During policy installation, a process of updating all users' Access Roles and their group affiliation is performed. For a large scale environment, it is recommended to disable these user group updates during policy installation. Note: If user updates are disabled, it is recommended to set up a periodic update, which will run the CLI command pdp update all. Instead of disabling the updates the rate can also be tuned starting from R80.10 and up via the "pdp update update_rate xxxx" command. sk122686 - How to debug Identity Collector? Identity Awareness Administration Guide (R77, R80.10, R80.20).